Auto Shutdown Computer with Desktop Right Click Menu. Create a Menu to Shutdown Computer on Desktop Right Click Menu. You can Easily Shutdown your Computer Automatically and can have a quick access to Shutdown Computer immediately with Turn Off Monitor Software Utility. Download & Install Turn Off Monitor Software utility on your Computers or Laptop to add Desktop Right Click Menu to Shutdown your Computer quickly. 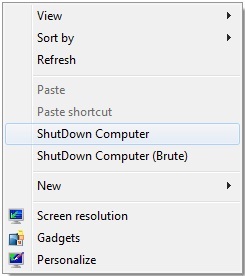 You can Create Desktop Right Click Menu to Shutdown Computer as well as Shutdown Computer brute (Force). Easily go to Desktop Right Click Menu and Shut Down your Computer. Download Easy Shutdown Software to Auto Shutdown Windows as per desired Schedule. Browse Various Windows Shutdown Software Applications and Utilities by Categories, Screenshots, tutorials and more. Will Easy Shutdown work on Windows 8 ?